To be printed two-sided flip-short-edge and folded. 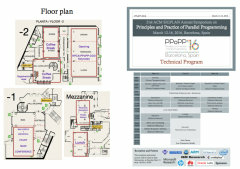 RoMoL 2016 will also take place on March 17-18 2016 in Barcelona, right after the HPCA, PPoPP and CGO 2016 conferences. The Call for Participation is open till March 2. See http://romol2016.bsc.es for more details. We recommend you to book your accommodation as son as you can, since there is a very important soccer match of the Champions League between FC Barcelona and Arsenal FC on March 16th. Since the conference is very close to the soccer stadium, this will significantly increase the occupancy in the hotels in the area, especially for that day. The Artifact Evaluation procedure for PPoPP 2016 has finished. The list of accepted artifacts can be found at http://ctuning.org/ae/artifacts.html . Registration is now open. Please follow this link. A total number of seven workshops and four tutorials has been accepted. The process has been really competitive this year, with an all-time record of 21 workshop proposals being submitted. This means that, sadly, some high quality proposals have had to be rejected due to space constraints. 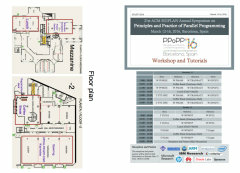 PPoPP workshop and tutorial sessions will be in parallel with CGO and HPCA and there will be a total of 10 parallel sessions among the three conferences on Saturday and Sunday, which is a great milestone as well. Please, have a look at the list of accepted workshops and tutorials.